Giroud move to Chelsea at least at the moment is not paying off, in fact, looks like its a bad move already. Barely 24hrs after witnessing Arsenal defeat at Swansea, he completed his deadline day move and watched Bournemouth trashed Chelsea 0-3 nil at Stanford Bridge followed by a 4-1 defeat in the hands of Watford. First, Even in the absence of Morata, Antonio Conte prefer to start Eden Hazard up front against Watford. 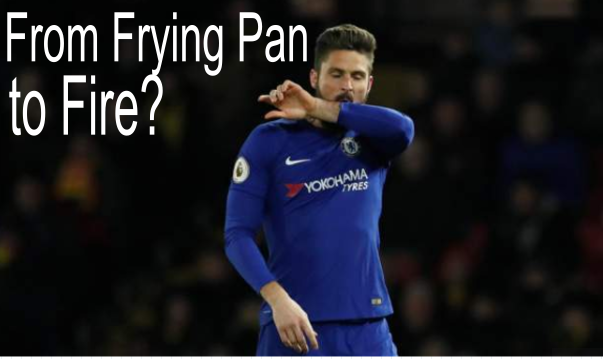 This is not an encouraging sign, Giroud, a veteran of the Premier League does not need a gradual introduction to life at Stamford Bridge, and so if he is prominent in Conte’s plan and high in his estimation, he should be starting the game at Watford, that he started from the bench is worrying for a player who apparently left Arsenal because of a reduce opportunity for a starting place and an ambition to feature in the French team at the World Cup in France. Secondly, he joined Chelsea at the worst possible time, Chelsea has now lost 6 league games already this season, they lost 5 in the entire 2016-17 season. Chelsea has also lost consecutive Premier League games by a three-goal margin for the first time since October 1995 (4-1 v Manchester United, 3-0 v Blackburn). When a team is in that cycle of poor results, particularly at clubs like Chelsea, it usually takes something drastic like the sacking of a manager, but while Conte is still there, a poor team confidence is not a good news for new arrivals. Giroud and Chelsea’s struggle came at a time Arsenal seems to have found their stride again, and Dortmund, a club he could have gone, probably for a more regular place also won their first game since the close of the window, ironically, Michy Bashuayi bagging a brace on his debut. It is too early to judge his medium to long-term success at Chelsea, the sign does not look good and it will be a shame if his decision to turn down Dortmund advances for logistical reasons hurt his chances of going to the world cup.